Today was Jessie’s baby shower. So I had a lot of opportunities to show off the design and gain some consensus on undecided points by 3 generations of mothers. This image hides the front of the crib, so you can have a clear view of the back panels. The are 2 back panels each 1/2 ” thick. They are simple flat panel and frame construction. The stiles are 3/4 ” thick. The flat back panels were a hit especially by those such as Kelly who have had to clean up after the ejection of “processed formula”. 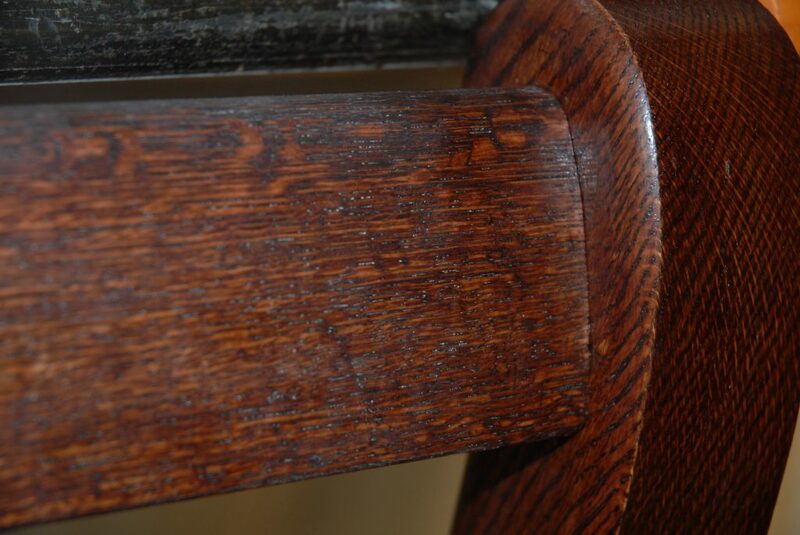 The front and back lower rail bottom edges were lowered 1″ to allow for greater overlap with the mattress sides when it is in the bottom position (on the floor. The inside of side rails will now be flush with the inside of the legs. This will mean there will be one screw per leg visible in the end. I am still not sure if they will be inserted from the top or sides. That will have to wait until I have the parts in hand. Inside dimensions were double checked against the standards. I want the mattress to fit properly and not have too much of a gap. Having the riser under the top horizontal rails will also allow it to have the mortises cut accurately without having to worry about how to jig up the curved front and back top rails. The idea of doing some inlay work was rejected. So much for Isla’s palm trees. As you can see above, all of the joints have a reveal. So this can be a “finish first and glue up later” process for the finishing and assembly as I have done on the craftsman style beds. This saves a LOT of time sanding, cleaning up glue squeeze out and removes worries about glue blotches. I use pigmented and thickened epoxy for the glue up. Additionally the longer set up time with a slow curing hardener allows for the alignment of the many parts that are in each assembly. 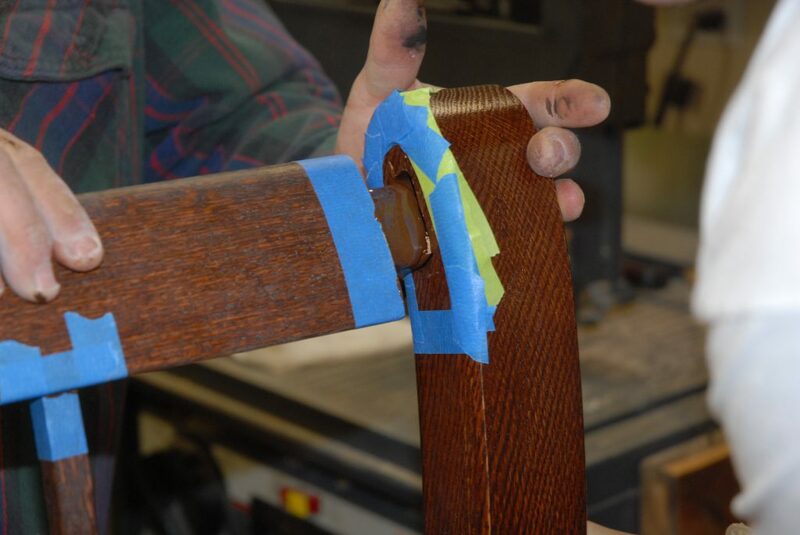 Below is a preview of this finish and assembly technique from prior projects. Over one hundred spindles laid out and ready for finish coats. Racked out and ready for the spray, turn, spray, turn, repeat routine. 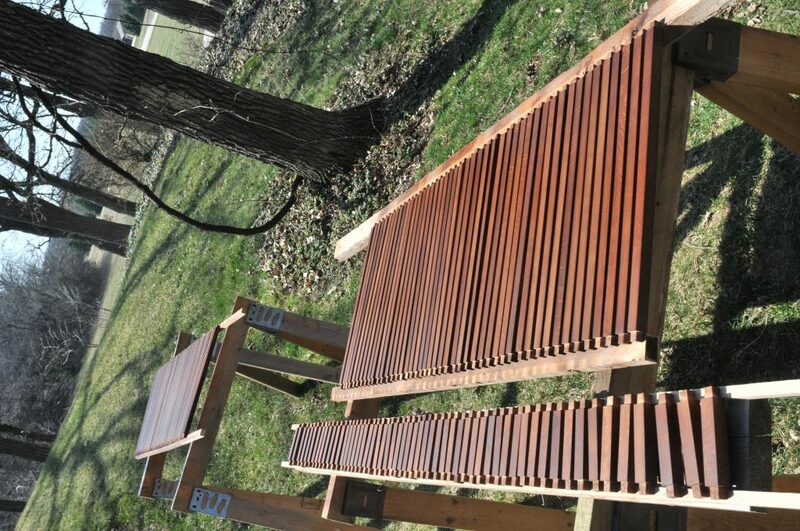 Spraying on the final coats on an unseasonably warm March day for Teal’s and my bed. Dry fit assembly and masking the joints on Elyse’s bed. 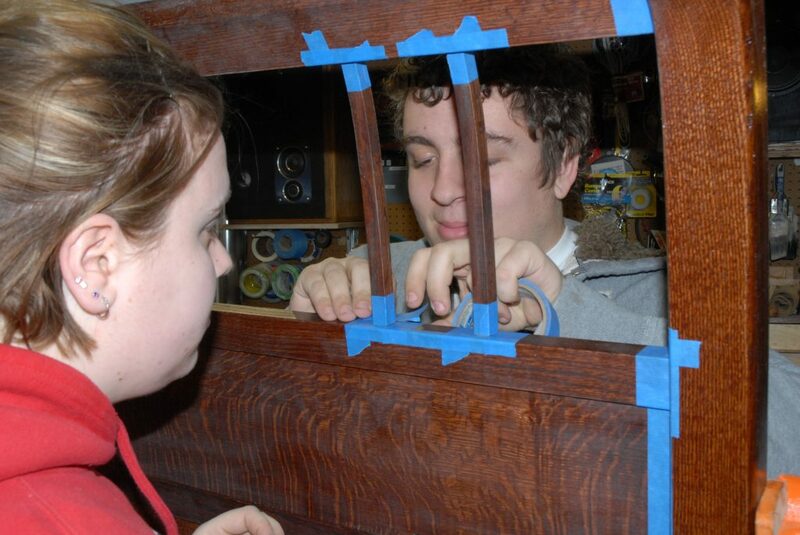 Glued up and inserting the tenons. 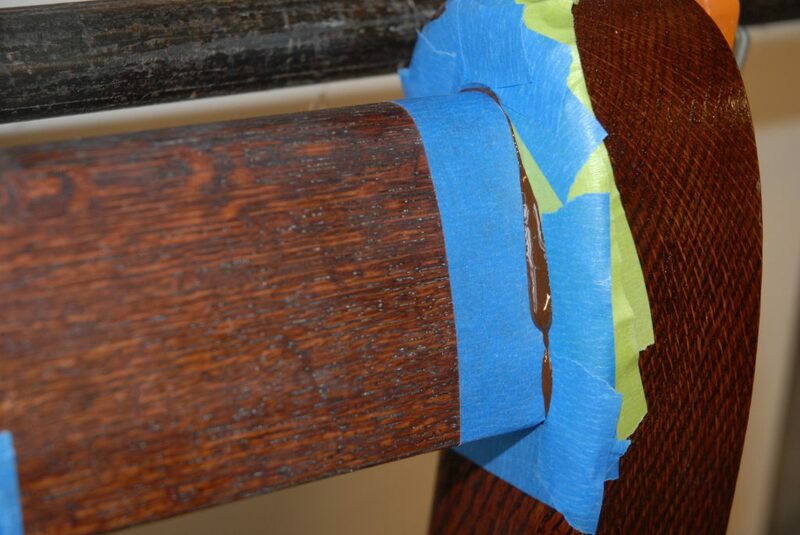 Note the chocolate color of the epoxy. 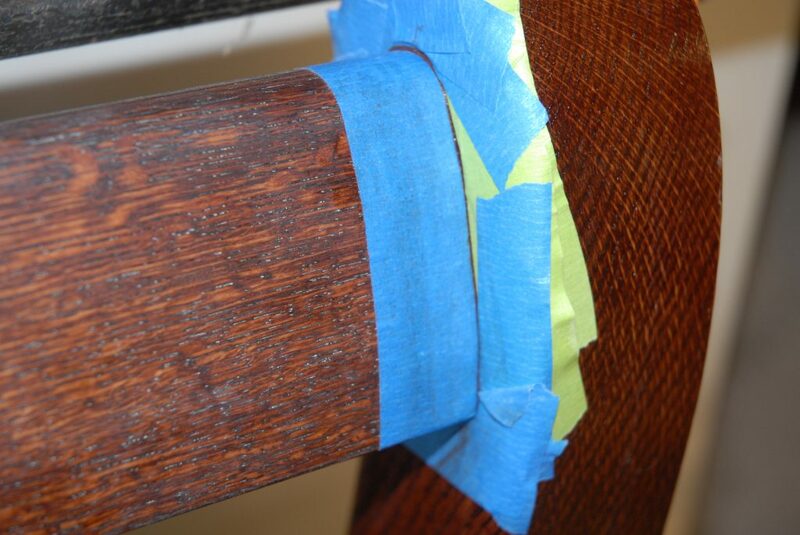 Glue squeeze out prior to clean up with a plastic scraper and denatured alcohol. Cleaned up after final paring of the last of the squeeze out 8 hours later. Most is wiped up early but there are some areas that it is better to wait and pare off later. At this stage the epoxy is sort of the consistency of cheddar cheese and cleans up nicely. It is not yet rock hard as it will be at about 24-36 hours. Final joint appearance. Now that we have a starting point for the design, it is time to start gathering dimensions from the photos. Traditionally, I have done this by printing photos at half or full sheet and then scaling it manually. My goal when borrowing from an existing design is not an exact replica but rather using the original as a model to start for overall proportions. I am not into doing reproductions. Additionally, in this case I am making improvements in the design. First, I will note the major known dimensions. In this case it is overall height width and depth. This is done on each photo. Do not assume (or forget) that the scaling will be different in each image. Next the actual size in the photo for these is measured and the scaling amount calculated. I will normally do the actual measurements in mm to make the math easier (avoiding fractions). You can use a caliper or ruler – I like using a caliper. 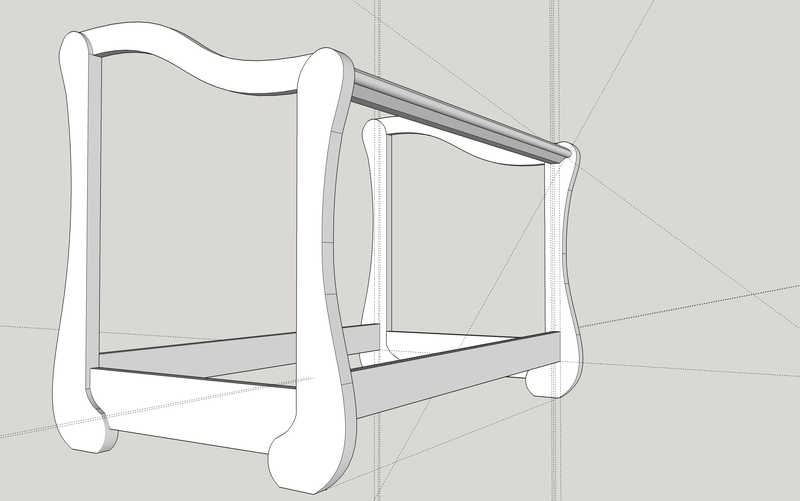 I will typically start on paper and make sure that the dimensions make some sense before transferring to Sketchup. You can also import a photo into sketchup and then start drawing your components on top of it. For rectilinear pieces it is better to use it to set a few lines and then draw as you normally would. Trying to match the photo underneath will otherwise lead to errors and out of parallel edges. Here I have started with the curved end pieces. With the rudimentary curve drawing tools in Sketchup (arcs, lines and bezier curves) it took a lot of tries to get something that looked decent. I wish I could have gotten the NURBS lines to work which offer much more control. At this point I will lay down a couple of lines to mark the lower rails and then hide the photo. So now I can move into 3D space. each of the parts show becomes a component so I can mirror them for the other end and all of the modifications transfer as I work back and forth. The top and bottom rails are then fit to the end posts. Now I mirror the ends, and set them approximately the right distance apart. I am still not sure if the end top and bottom rails will fully or partially overlap the legs. Next come the bottom rails and I then draw guide lines up the leg posts to show where the top rail should line up vertically and the offset for the spindles from the inside edge. 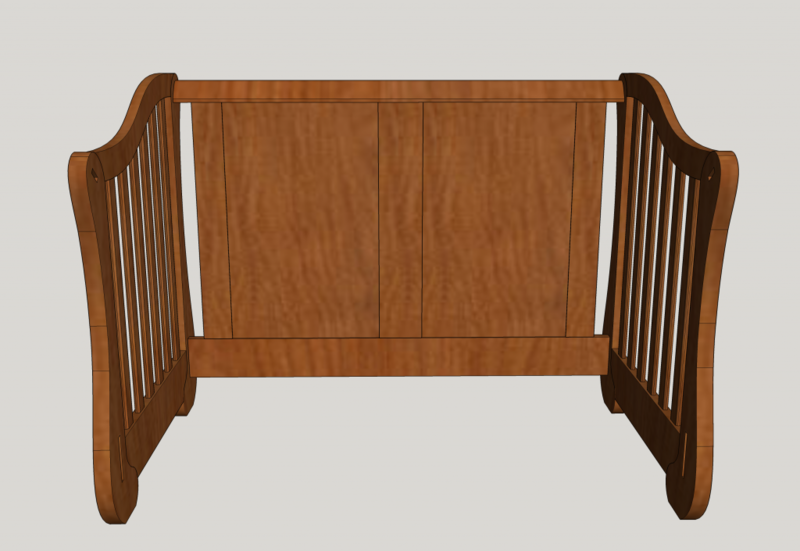 The inside spacing is an important dimension as you are only allowed 28 +-5/8″ by CPSC guidelines so you don’t have too big a gap around a standard crib mattress. The front top rail is next. It took a few tries to get something that is not too thick. I may still make it a bit taller. Lets see after the rear top rail is in place. Now with the the back rail placed, and the frame colorized you can see the shapes better. I think it looks better with the taller top rails, but lest see what the girls say tomorrow. My daughters, Jessie and Elyse, are both due at the end of March 2018. Jessie still needs a crib. So the question of: “What is the next project?” has been decided, and I have a rather short timeline. 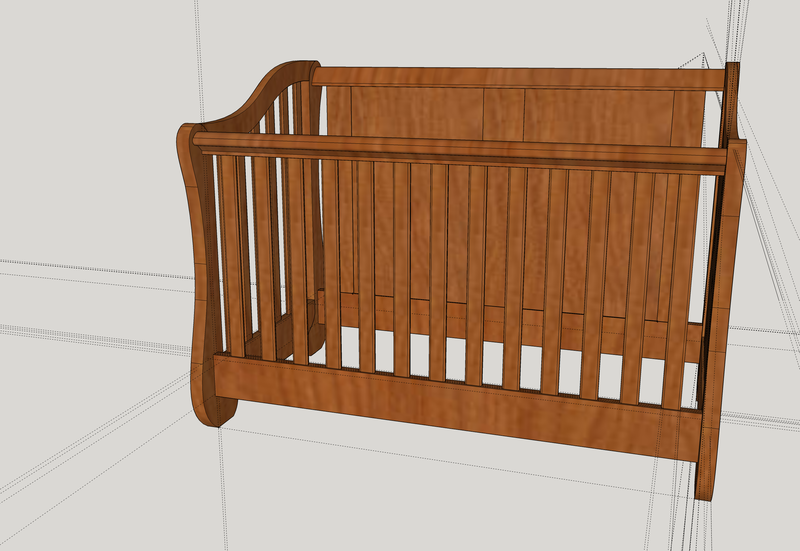 However, if push comes to shove, she can use the same cradle that she slept in as a baby that my dad made, while I finish the crib. This is another project where I am following in my Father’s footsteps making things for the grandkids. Solid back – avoid little fingers finding outlets and easier cleanup after dinner gets launched. Flat panel rather than raised panel per Jessie’s preference. Convertible to a bed. This will make it last, rather than be a 2 year item. Appearance as a bed will take precedence over appearance as a crib. Follow CPSC guidelines for safety. This includes no cut outs – so much for Mackintosh style slats I had wanted to do on the CNC router (besides Teal and Jessie are not fans). So we have been digging through many Google Images, Pinterest, LumberJocks and many other websites looking for ideas as a launch point. There are a lot of ugly cribs out there! 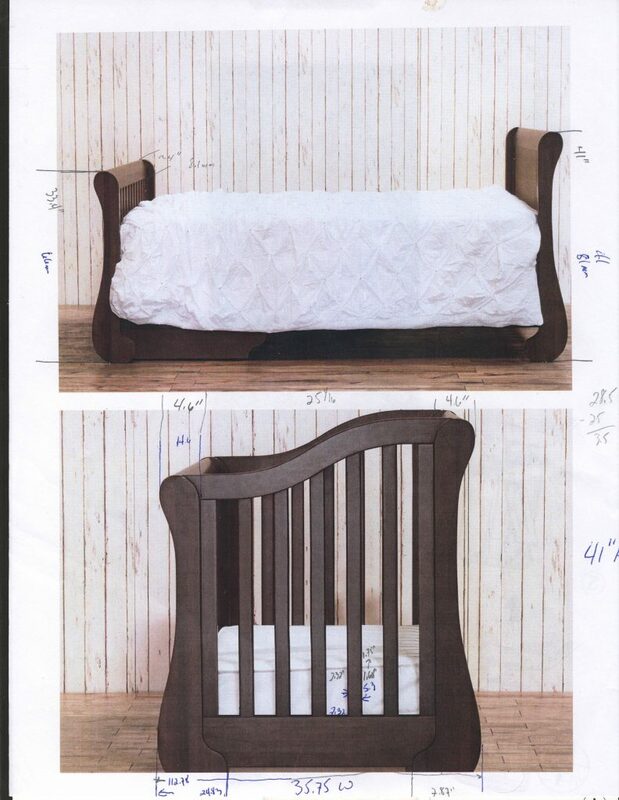 Besides, many designs that look OK as a crib do not look very good as a bed. 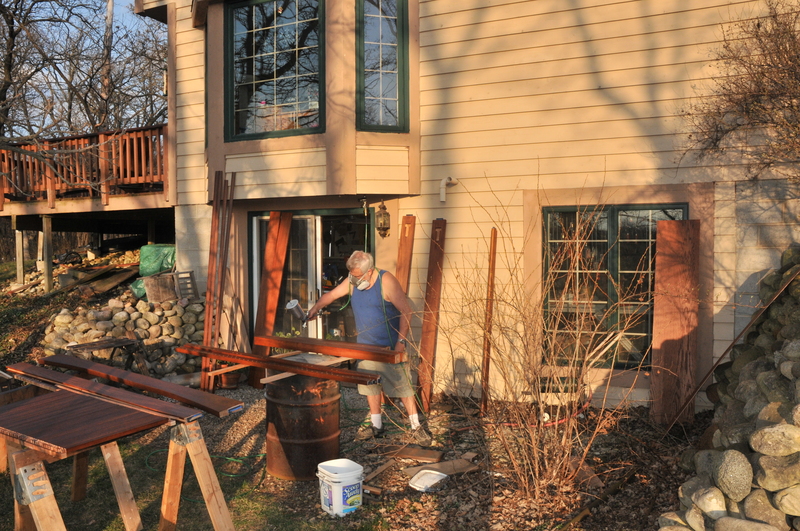 On top of it you have the predominance of MDF and particle board based junk that is on most of the web sites. 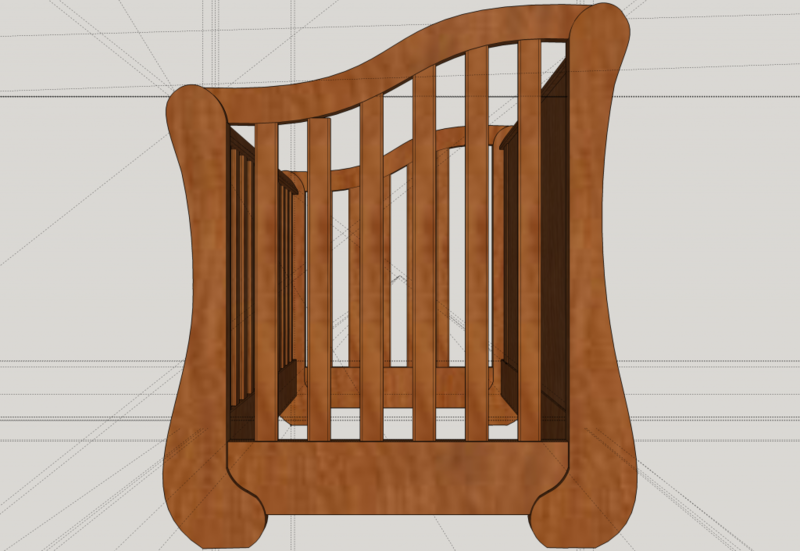 Given that Jessie is expecting a girl, I was hoping for a sleigh crib / bed sort of design. 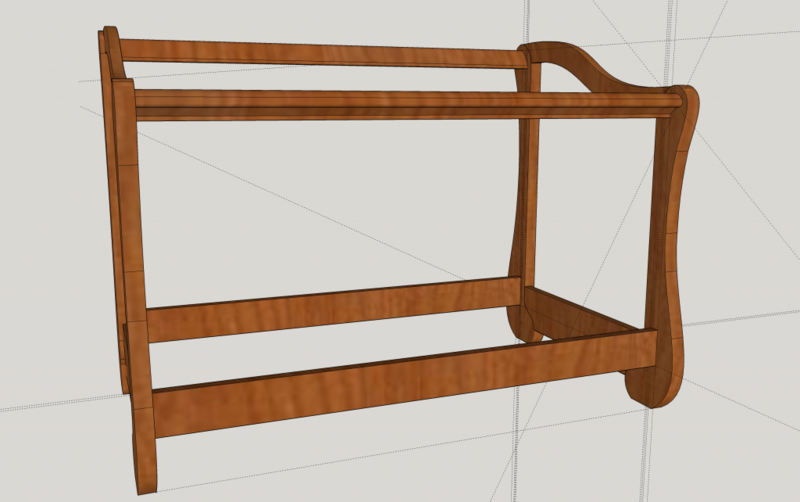 However, many “sleigh cribs” have weird lumps for curves that seem to have been tacked onto an otherwise square leg. I want something that will be smooth and flowing. Plus, this will give me another excuse to play with the CNC router. Although, a band saw and spokeshave or template and router would probably work well, too. 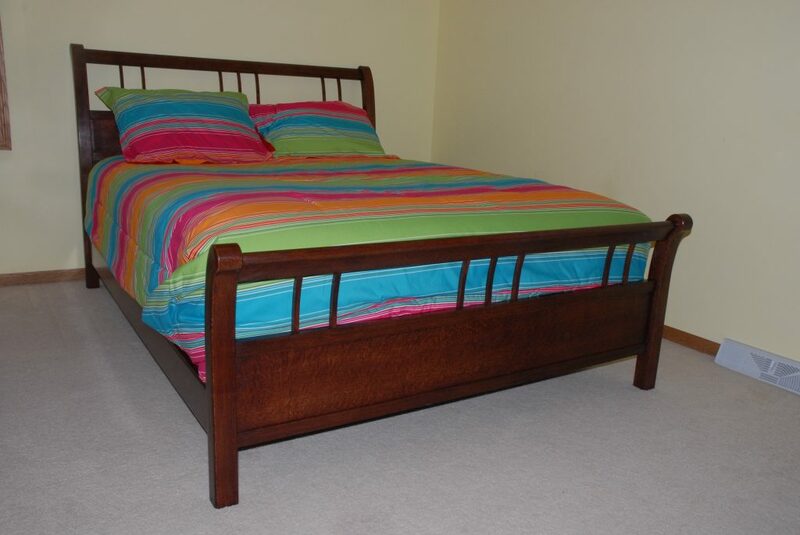 For Elyse’s queen size bed, the curves were laid out on a template and then pattern cut with a band saw and router. Her bed (ca. 2009) is shown below. Now, I want to do something that is more “organic and flowing” for the end posts rather than ending squarely at the floor. This is a tall order for an engineering mind. 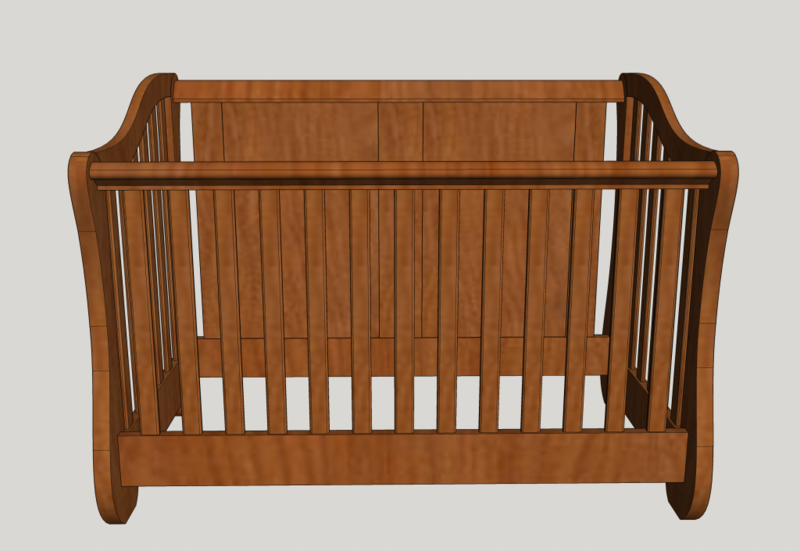 CPSC website: Full-Size Baby Cribs Business Guidance & Small Entity Compliance Guide which provides the inside dimensions but is silent on spindle spacing. International Association on Child Safety: iafcs.org/docs/Docs_Head_Entrapment_Presentation_Revised_2013.pdf which does provide spindle spacing and other useful information. 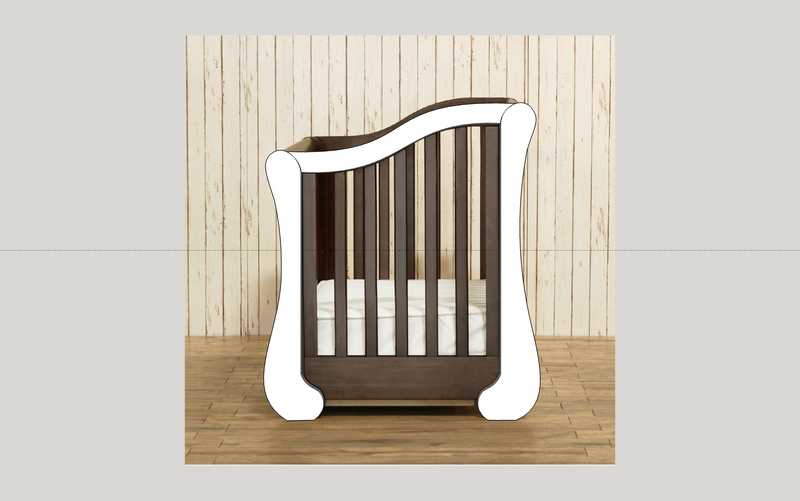 National Institutes of Health: Age, side height, and spindle shape of the crib in climbing over the side. After several evenings of web searches and IM messages back and forth with Jessie, a leading candidate for the basis of the design emerged. It is the “Franklin and Ben Mayfair Crib”. For an example see: Mayfair Crib This was the first site that it popped up on. Others sites list it as discontinued. This is just a starting point. As on many projects, I will look at multiple designs and then take the pieces I like and modify for more robust construction and the techniques that I prefer. So now I need to gather basic dimensions and start the new design.